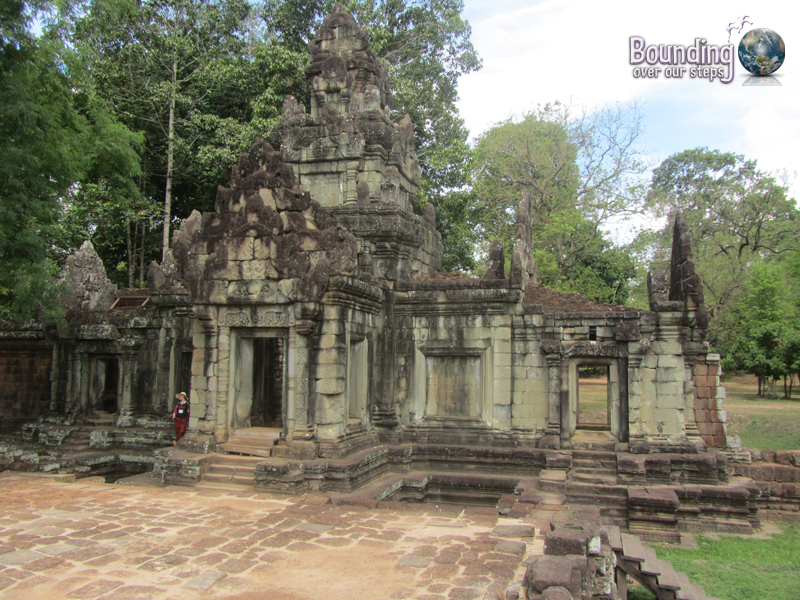 Angkor Wat, the most visited site in all of Cambodia and possibly in all of Southeast Asia, had been on our bucket list for quite some time. 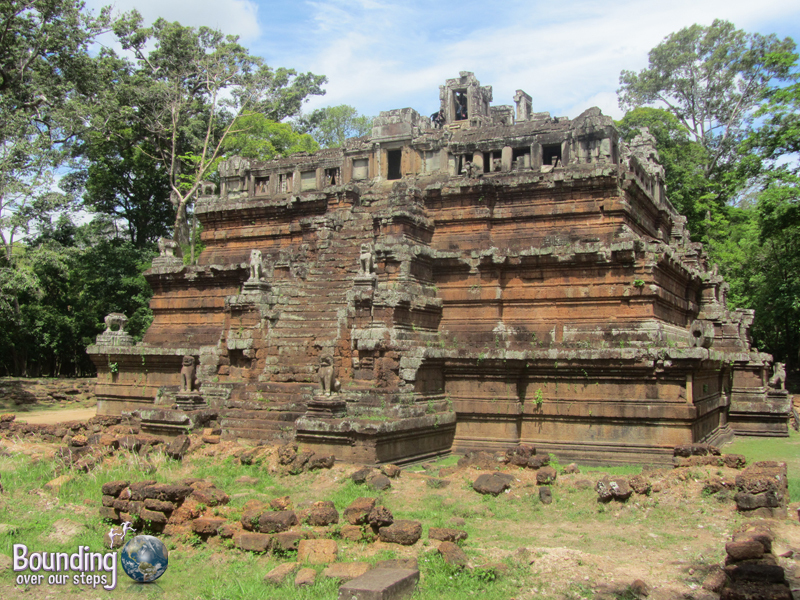 So when in northern Cambodia doing some volunteer work at the Cambodia Wildlife Sanctuary, we simply had to include a visit to the UNESCO World Heritage Site. 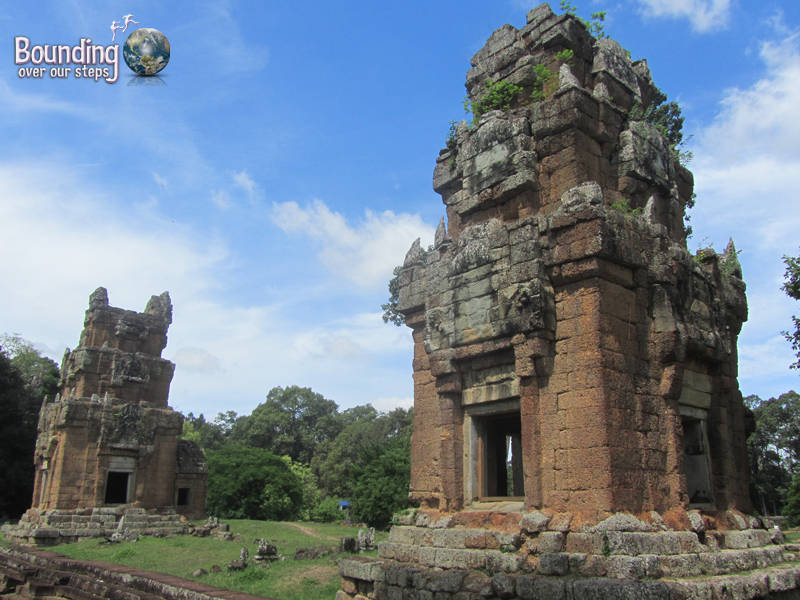 Situated only 5.5 kilometres (3.4 mi) north of Siem Reap, it is easy to plan a trip there via bicycle or tuk tuk. 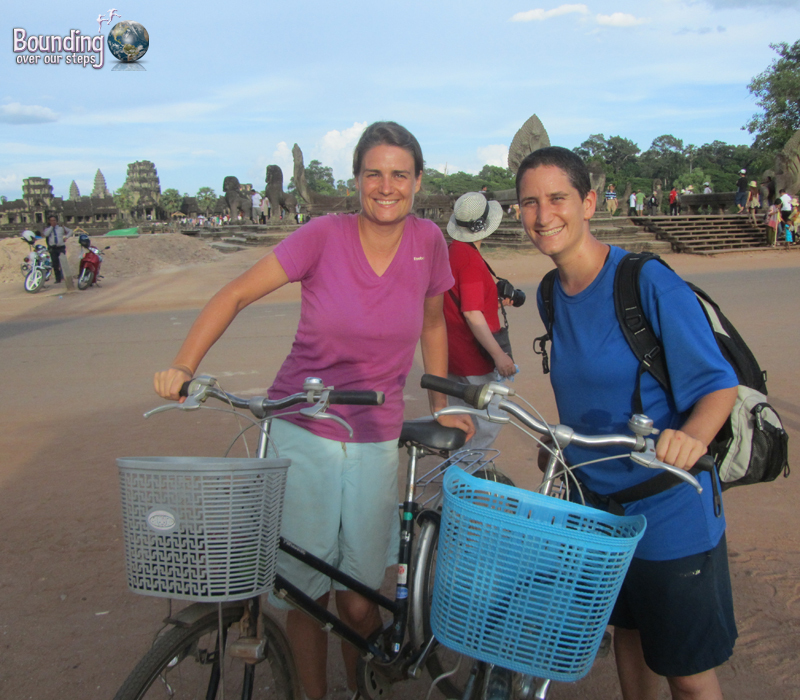 We opted for the freedom of a bicycle but measuring approximately 400-square-kilometers (160-square-miles) bicycling the Angkor Wat complex, considered the largest religious monument in the world, was quite the workout. We began our Angkor Wat adventure by riding our rickety $1-a-day rental bicycles to the ticket office, which is on the right hand side of the main road leaving the city to the north, the afternoon before our intended day of visit. With our limited time, we opted for the $20 per person one-day ticket, but had we had more time, the 3-day ($40) or even 7-day ($60) tickets would have been worth it, especially since they do not have to be used over consecutive days. We were surprised when they took our pictures and printed them on the actual ticket itself. 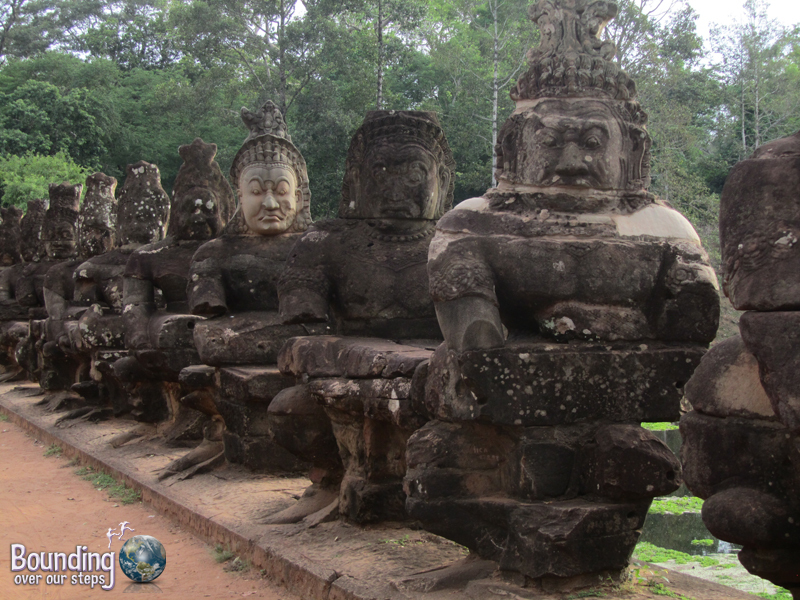 If we had wanted to, we could have really made the most out of our day pass by spending that evening at Angkor Wat, watching the sunset perhaps. But we were already tired, so decided to save our exploration solely for the next day. We began our day in the darkness of 3:30am, when we retraced our route from the day before, riding our uncomfortable bicycles on the main road heading north past the ticket office. The dim light the street lamps offered became increasingly lower as we got further from town. 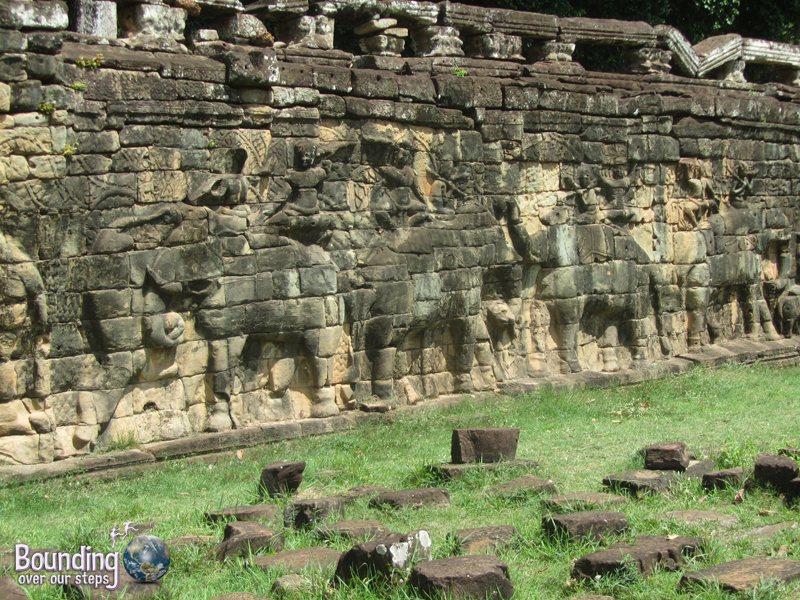 Reaching the southern moat wall of the Angkor Wat temple, we turned left and pitch darkness swallowed us completely. To match the condition of our bicycles, the pathetic headlights did little to light our way. In all fairness, though, the lights were pedal-powered, and our legs weren’t pedaling too powerfully. The adventure of riding bicycles beside ancient ruins, barely visible in the pale moonlight, was certainly not lost on us. We eventually made out the shape of a man in the middle of the street who told us to park near the tree on the left and cross the street to Angkor Wat. Although it was 4:30am, employees with flashlights approached us immediately upon crossing the street to check our tickets. Heading back into the darkness, we realized how helpful having our own flashlight would have been. Thankfully, we were there early enough to give ourselves plenty of time to stumble our way through the darkness and find the perfect spot to watch the sunrise. 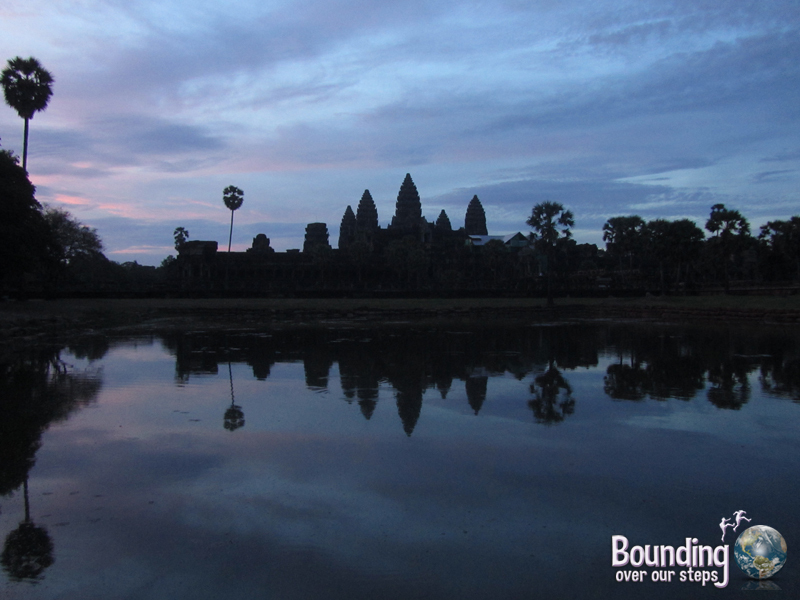 To be perfectly honest, on our one morning at the edges of the reflecting pool in front of Angkor Wat, constantly snapping photos like all the other camera-toting tourists, we found ourselves a bit disappointed with the whole sunrise experience. Perhaps it was due to the very cloudy morning, or the fact that the lake seemed much smaller than we had seen in pictures, possibly due to it being at the end of the dry season. Or, maybe that as the sky brightened and the silhouetted temples came into better focus, we could see that Angkor Wat was under construction and in part covered with a big, green tarp, obstructing our view of the ancient ruins. 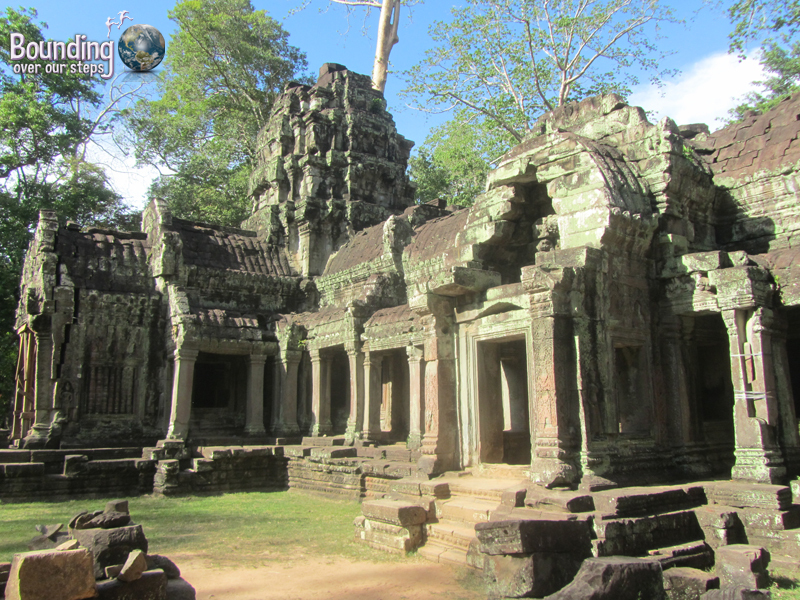 With over 1,000 temples making up the archaeological site of Angkor Wat, there are an exponential number of possible itineraries. Although we wish we had taken some time beforehand to research and plan a route, we’re pleased with our single day visit. We’ll let some of our photos tell the rest of the story. 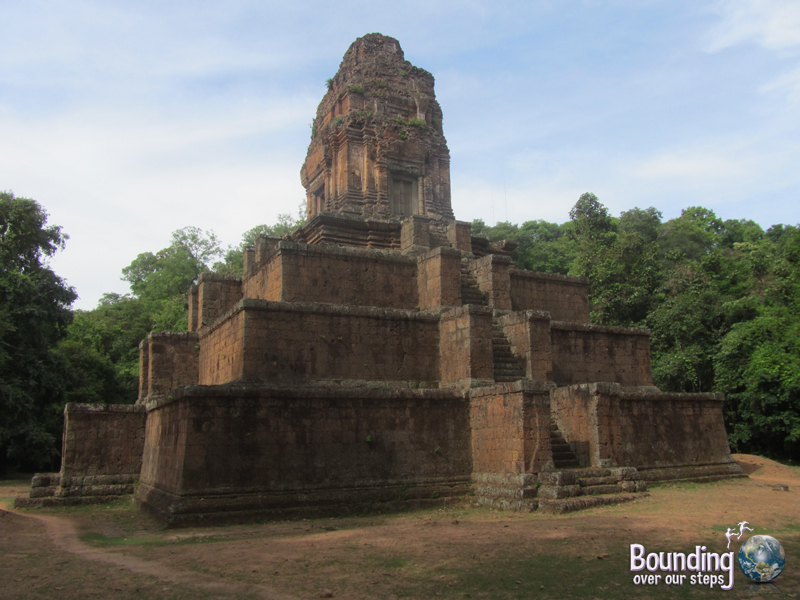 We climbed the to the top of Phimeanakas! 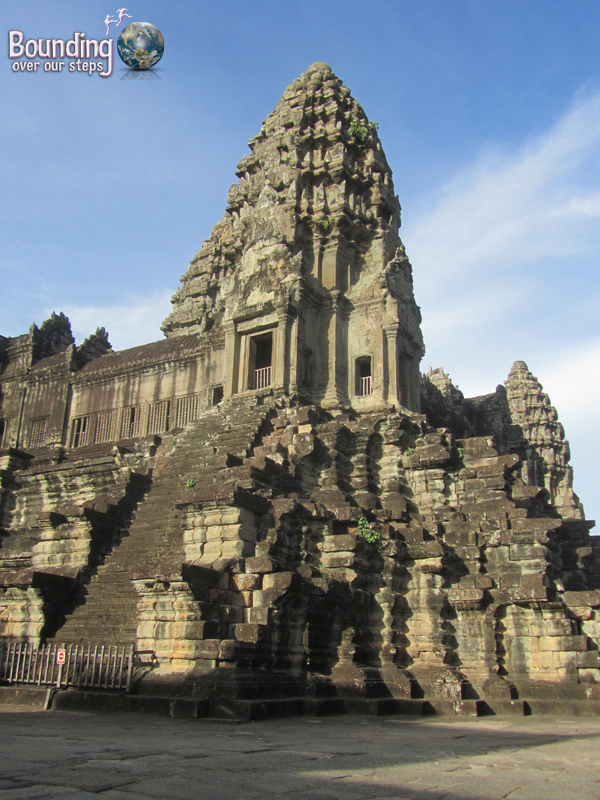 Is Angkor Wat on your bucket list or have you already crossed it off? Do you have a favorite temple? 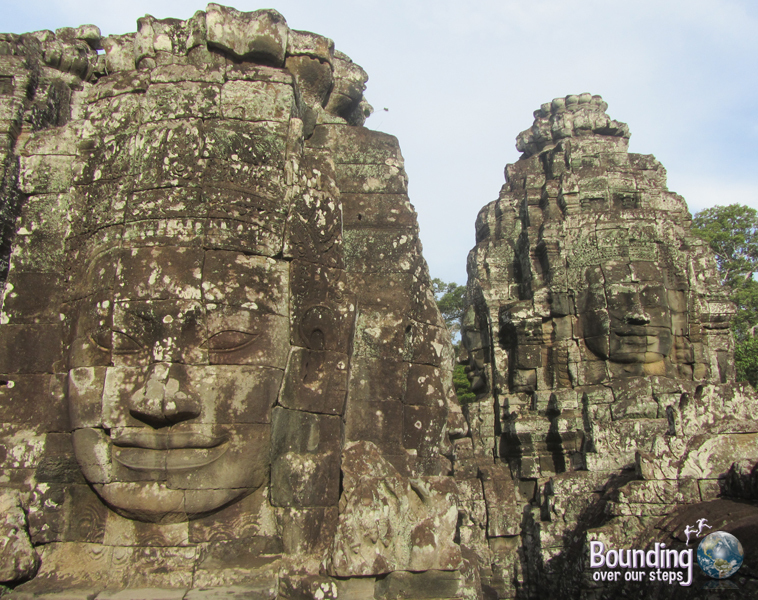 Do you have any tips for making the most out of an Angkor Wat visit? I loved the sunrise picture, even if you were disappointed by that part of your visit. I will be here at some point before May. Originally I was planning to go in May, but now I am considering going in December because I don’t want to wait any longer. Hey Jennifer! Thanks for reading 🙂 Keep in mind that December will be the height of the tourist season, so Angkor Wat will definitely be flooded with tourists and especially so at popular sunrise spots. Great post! 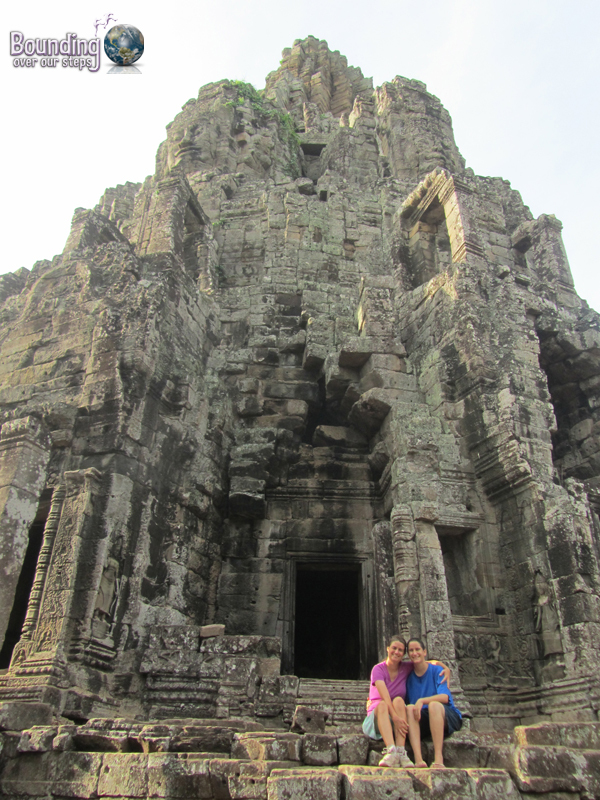 We just visited the temples this week and decided to skip the sunrise tour. It’s rainy season now, so we figured we wouldn’t be able to see a nice sunrise like yours anyway. LOVE all of these photos. Really makes me want to go back. 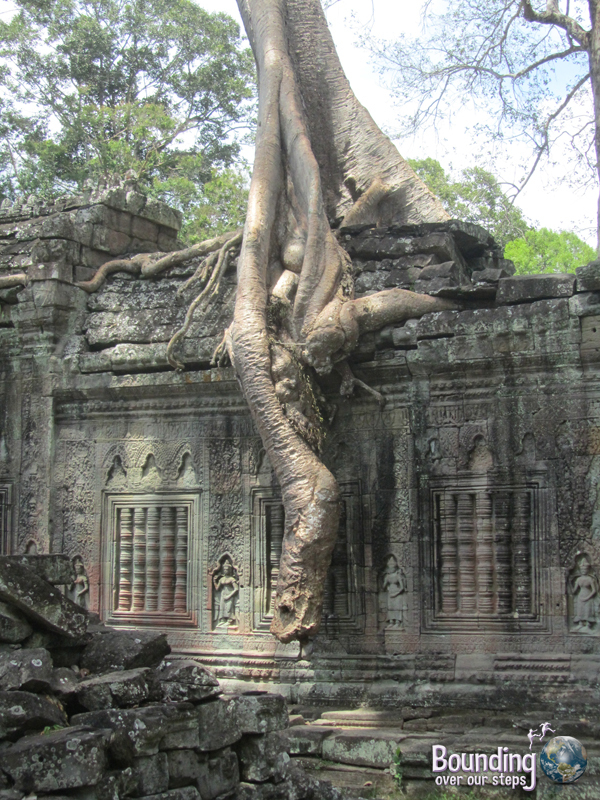 Angkor Wat is definitely on my bucket list as well! You both are lucky to have found each other. I’m a nomad and my wife doesn’t have much interest in travel. We definitely feel lucky – for sure! But, just so you know, Mindy wasn’t as much into traveling as I was at the beginning. After dragging her to places abroad, she learned to appreciate and now loves it. She suffers from extreme motion sickness making the act of getting to places a very unpleasant chore. Maybe there is hope for your wife. Hey… can you please tell when did you visit? I am trying to evaluate the effects of dry season in the surrounding vegetation as I will be there in early April. 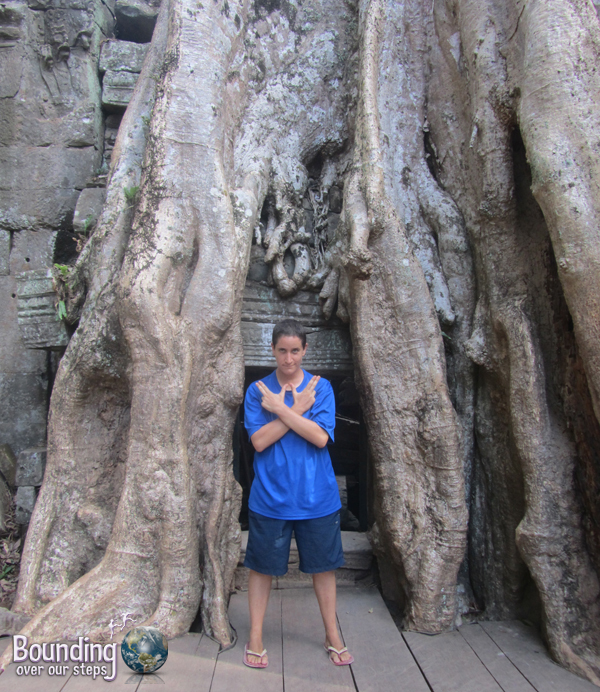 Your pics look amazing and have made me very excited about my up coming visit to Angkor Wat. 🙂 I will be going there next week, and I’m just trying to figure out whether it’s worth going for sunrise or not, it sounds like it’s a little overrated and overcrowded too. Despite the mixed reviews, I’m thinking I’m just going to do it anyway as I might not get the chance again, and I’d hate to miss out on a cracking picture!